We are pleased to announce that we are holding a “Help Japan Auction” and our editors are donating their art, books, supplies etc. This event will run from April 1st through April 7th. During this 7 day auction you can bid on any items you see listed, simply leave a comment with your bid amount. At the finish the highest bid for any item or items will win the bidding on the item or items. ALL the monies we collect during this auction will go to the Salvation Army. The highest bidder then sends the payment to admin@craftgossip.com via PayPal then each Craft Gossip editor will contact you and ship your winning item or items to you. If the winning bidder doesn’t make the payment within 3 days, we will select the next highest bidder. Sorry but this auction is open to US residents only please. My item is a necklace hand made by me called “Madam Butterfly”. It’s is a lovely 1 1/2″ x 1 1/2″ soldered pendant made from an original one of a kind collage (not a copy). 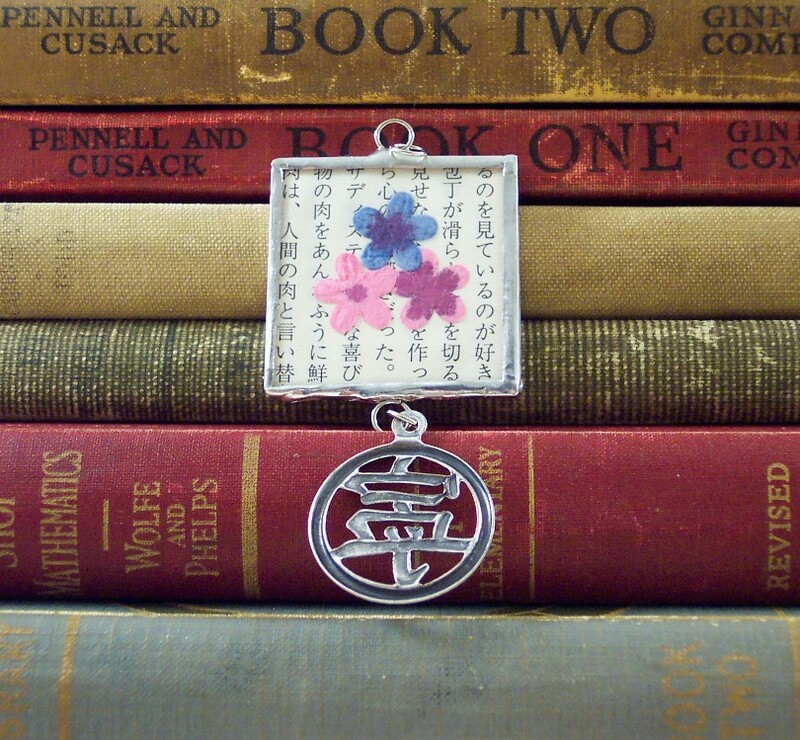 It features a beautiful geisha with big purple and blue wings, and a tiny pink and purple mulberry paper flower on a background of Asian book paper. The back of the piece has three tiny pink, purple and blue mulberry paper flowers. The collage has been sandwiched between two pieces of glass and soldered with scalloped, lead free, sterling silver solder. A jump ring is soldered to the top and another jump ring is attached to hang from the 24″ nickel free aluminum 2.4 mm ball chain, which is not pictured but I will include. 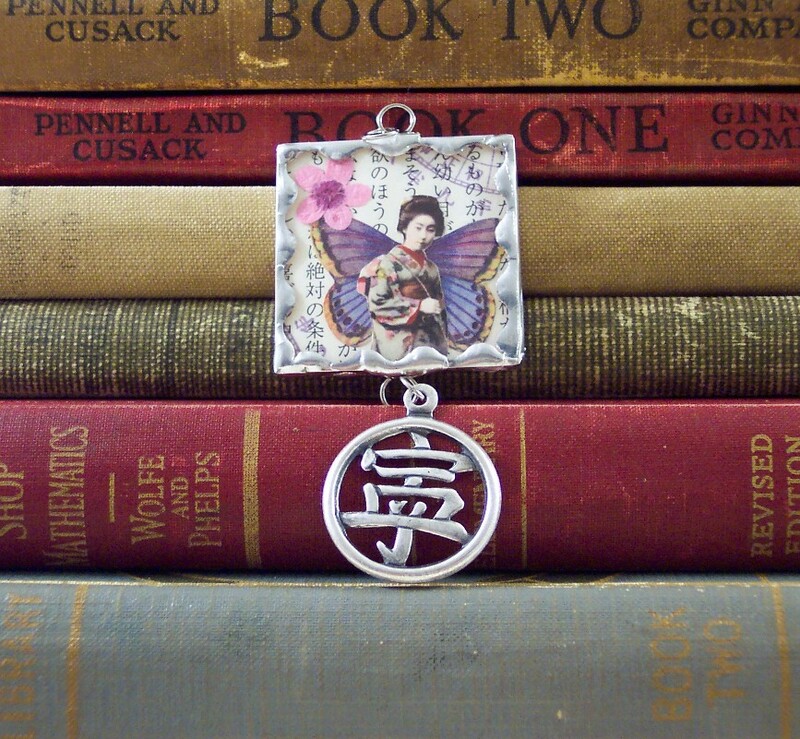 A silver kanji charm dangles from the bottom making the entire piece approximately 3″ long. Retail price is $20, opening minimum bid of $10 please. If you’re interested in this necklace please leave your bid in a comment on this post, good luck!